This is a very special blanket for Stafford. It may be my favorite crochet project ever! I did not make it by myself. I had some help from my Oma. Oma is my grandmother. She had a lot of yarn leftover from her many projects over the years. Oma passed away several years ago, and after she died I was given her yarn. In the box of yarn there were twelve blue crochet blocks. I didn't know what to do with them, but I couldn't bear to throw them away because of the hours of work that went into them. So I just kept them in the box. 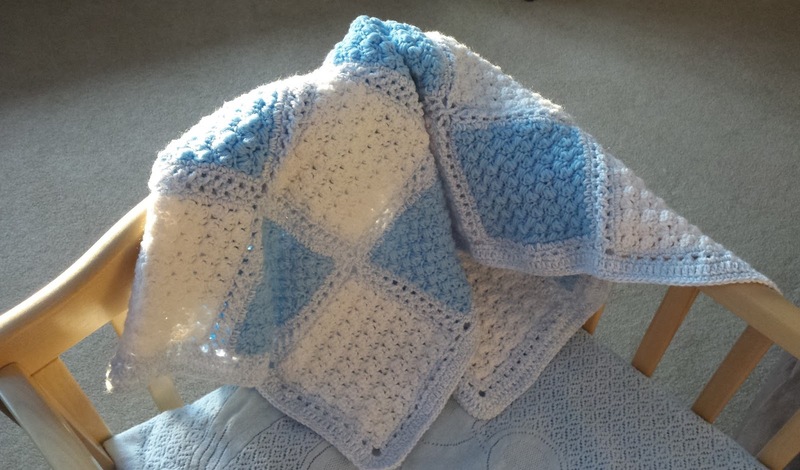 After I found out that Stafford was on the way, I knew just what to do with the blue crochet blocks! I would make some white blocks of my own, and then I would piece them all together in a patchwork crochet blanket. 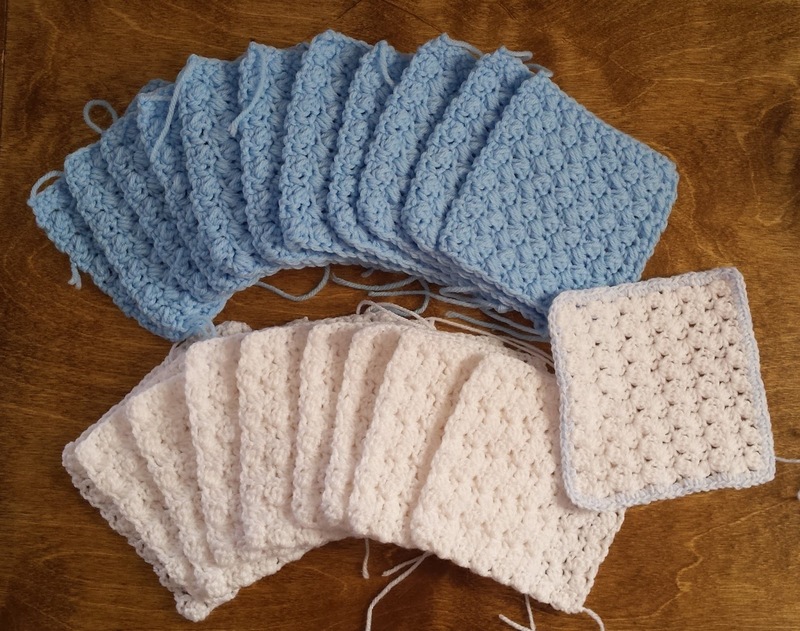 I found some white yarn, and I crocheted thirteen blocks that are roughly the same size as Oma's twelve blue blocks. 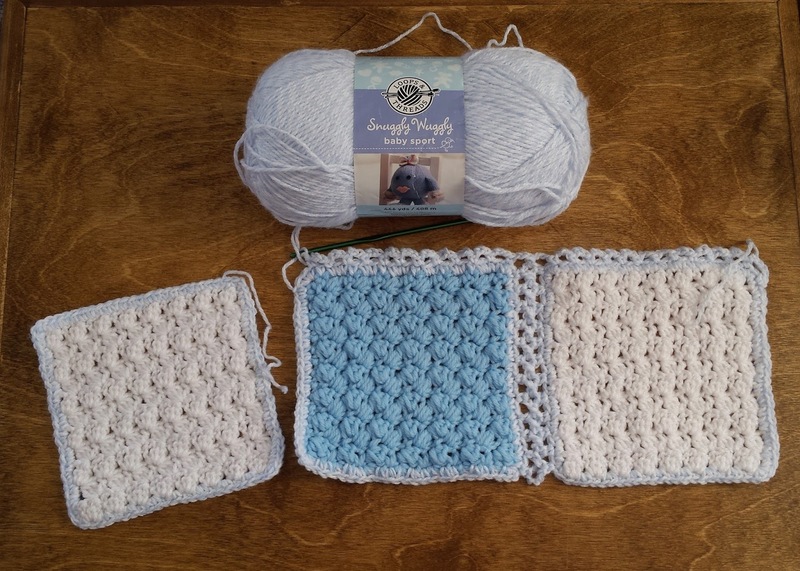 Then I crocheted a border using a blue and white yarn. I followed the instructions from Cheryl for a flat braid join. This is the first time I have done a blanket like this. Piecing crochet blocks together was completely new for me. I searched Pinterest for ideas of ways to join the pieces, and the flat braid join was the prettiest idea I could find. It looked difficult, but Cheryl had such clear instructions that she made it easy! I love how it turned out! 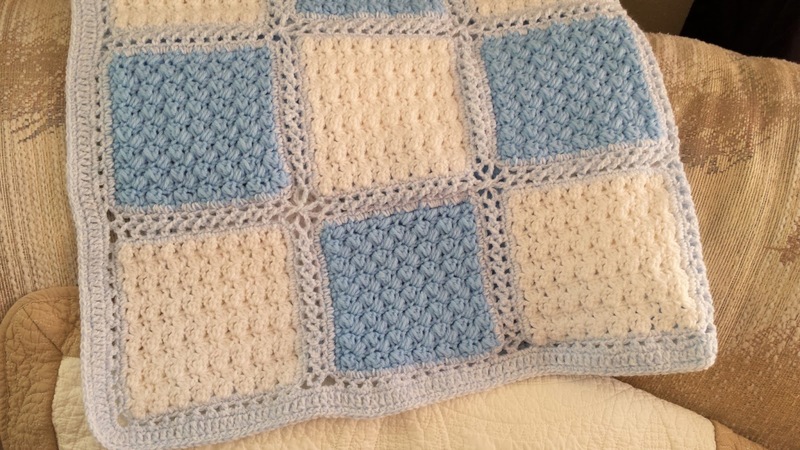 It makes me so happy to have a special blanket for Stafford that was partially made by his great-grandmother. 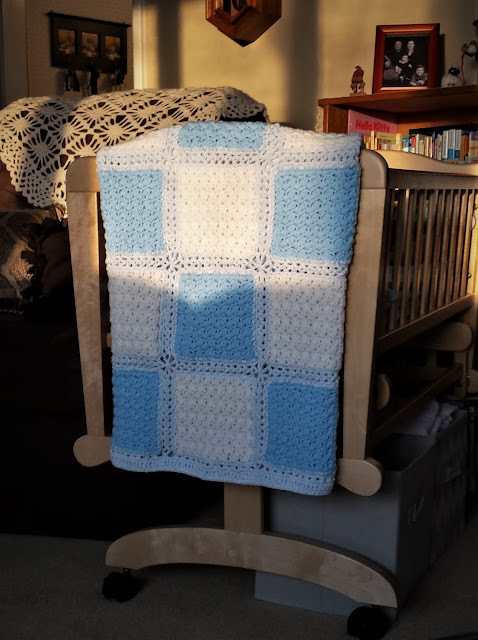 The blanket is about 38 inches by 38 inches. It's the perfect size for a baby. For the boarder I did a row of single crochet, a row of double crochet, and then a row of single crochet. 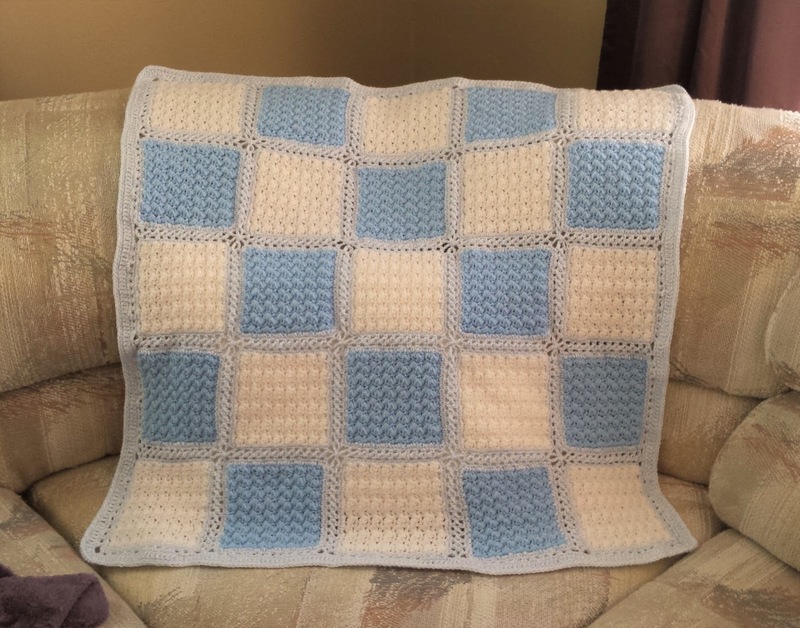 I only had one skein of the blue and white yarn to use for the braid join and the blanket border. I wasn't sure if I would have quite enough yarn, but I did! There were only two yards of yarn leftover. 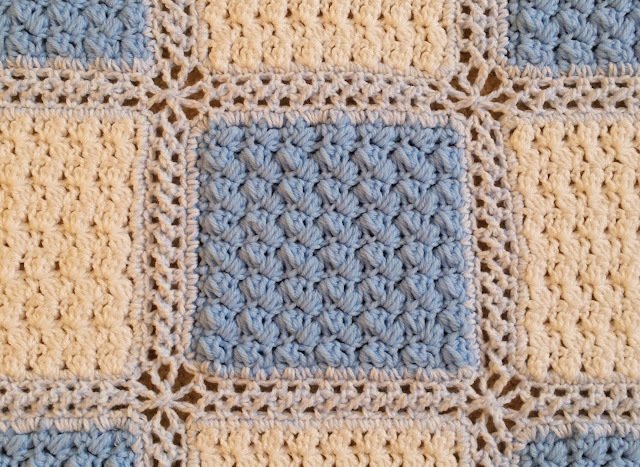 A close up of one of my Oma's lovely blue crochet blocks. The special blanket is in our living room waiting for Stafford's arrival. 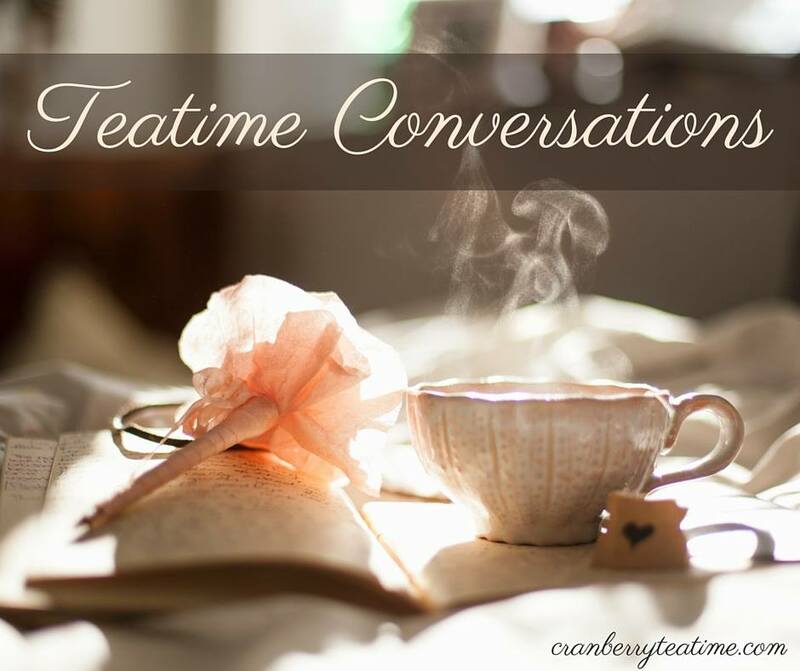 Have you been working on any projects lately? Craft projects or any kind of project? I'd love to hear what you are doing to keep busy.